Hurricane Florence was devastating to much of the Carolinas. The flooding that ensued destroyed not only homes and livelihoods, but greatly affected animal agriculture. 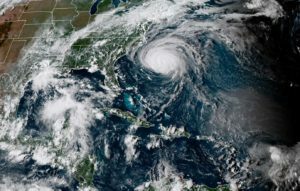 The effects of Florence resulted in the deaths of millions of animals and caused massive overflows or “overtopping” of animal waste, particularly from swine production facilities. North Carolina is the nation’s second largest producer of swine, and the 9.7 million pigs who call North Carolina home produce nearly 10 billion gallons of waste annually. The damages from Florence are disastrous not only from an economic perspective, but also from an environmental one. In livestock production, lagoons are large basins primarily used for the treatment of animal wastes. Rather than simply being a collection site for waste, proper care of a lagoon involves “feeding” the lagoon with microbes that help degrade the waste into usable fertilizer. However, during massive flooding events the volume within these lagoons can quickly rise and overflow. This disrupts the waste treatment process and exposes the environment to large quantities of nitrogen, phosphorus, or even pathogenic material derived from animal wastes. According to the North Carolina Department of Environmental Quality, at least 32 lagoons have overtopped due to Florence, and another 61 lagoons have sustained structural damage or are close to overflowing. An imbalance of nitrogen and phosphorus in any body of water contributes to a condition called eutrophication, in which excess nutrients allow for blooms of algae or plant matter. As these photosynthetic organisms flourish, they cause drastic changes to their environment. Algal blooms can be especially damaging, as many algae produce compounds which quickly reach toxic levels, algal overabundance clouds the water, and their rapid growth utilizes carbon leading to an increase in the pH of surrounding water. Eventually, algae change their own environment so extensively that they quickly die off, leading to subsequent microbial breakdown of the dead algae, which depletes oxygen. This rapid removal of oxygen then produces a “dead zone”, which is unsustainable for most life. While nitrogen and phosphorus can be detrimental to the environment in large quantities, these are still very necessary components of any animal’s diet. Nitrogen and phosphorus are used as building blocks to produce DNA, proteins, and other compounds necessary for the growth. Therefore, agricultural production will need to find ways to provide these necessary building blocks while also preventing an excess of them in the environment. Thankfully, animal science research efforts have produced a unique potential fix! Several years ago, researchers at the University of Guelph in Canada developed an animal designed with the world in mind: the Enviropig! The Enviropig is a transgenic animal, meaning its genome has been edited to contain a gene from a different species. 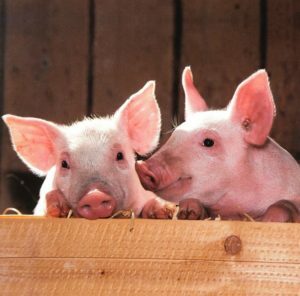 In the case of the Enviropig, a bacterial-derived gene for the enzyme phytase is expressed in the pigs’ salivary glands, allowing the animal to break down more of the phosphorus in its diet. With more phosphorus broken down into a form the animal can digest, less phosphorus winds up in pigs’ waste, meaning less phosphorus contributes to eutrophication. A win for the pigs, now able to get better nutrition from their diet, and a win for humans and the environment, as we are able to produce and enjoy a more environmentally sustainable product. While the initial work on this project was put on hold in 2012 due to public scrutiny of genetically modified organisms (GMOs), a team of researchers in China developed their own version of an environmentally-conscious pig earlier this year. This new animal is able to break down greater amounts of both phosphorus and nitrogen from its diet, reducing their abundance in animal wastes. Neither animal has been approved for use in the United States yet, but they both hold enormous potential to reduce the environmental impacts of animal agriculture. While the Enviropig and similar transgenic animals cannot yet solve every environmental issue, had they been mainstream prior to Hurricane Florence, perhaps there would be less concern with regard to ecosystem health after the flooding. Natural disasters are as unpredictable as they are unfortunate and dangerous; however, genetic tools such as these could provide one additional safeguard to protect the environment and public safety for the future. 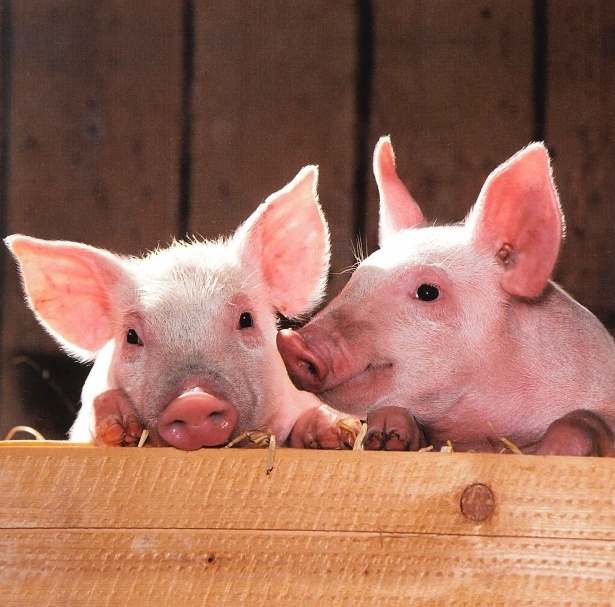 Livestock, such as pigs, can be genetically designed to help protect the environment! Peer edited by Joanna Warren.